Each year on our national day, there are several categories of award for the Australian of the Year. It is an important event, highlighting significant Australians who have made a difference to the lives of others. 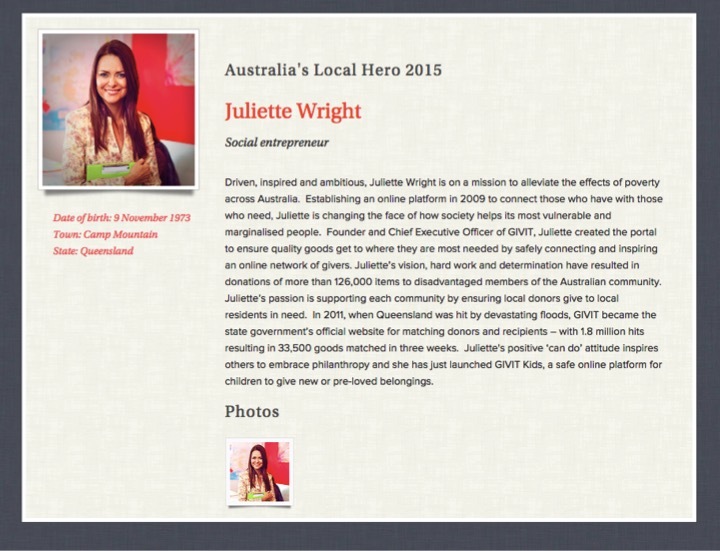 The Local Hero Award was presented to Juliette Wright, who founded Givit: Goods for good causes. She is described as a social entrepreneur. As I listened to Juliette’s story on the televised the award ceremony a couple of months ago, I thought about how technology has enabled so many positive initiatives in our society. The scale of the project could only be achieved through technology facilitating this social enterprise. This quote sums up what we have been talking about for a number of years – Incremental change in education is not adequate – we need big change. It’s more about taking a running jump across a chasm, than going step-by-step down one side of the gully and clambering up the other side. Then I looked at the date of this report – May 2009, six years ago. In 2015, school education has the capacity to provide a context where the school-age Juliette Wright may have been able to develop her idea. Yet, a commitment to entrepreneurial education is limited to the individual schools who recognise that it is essential to the future of our young people. It needs a systemic response. Let’s start. There is a bit of time to make up.